…don’t leave a jihadist sleeper cell in Canada. I facilitated a great game of Labyrinth at ICAMES yesterday. The jihadists made an early effort to overthrow the government of Pakistan, but failed and paid heavily. The US managed to improve governance within the Gulf, Saudi Arabia, and even Pakistan (the new “Singapore of South Asia”). With two oil cards in their hand, they were near a win. However, they also had a HEU card they needed to keep out of jihadist hands—especially with jihadist cells in Central Asia and Russia on the lookout for WMD. 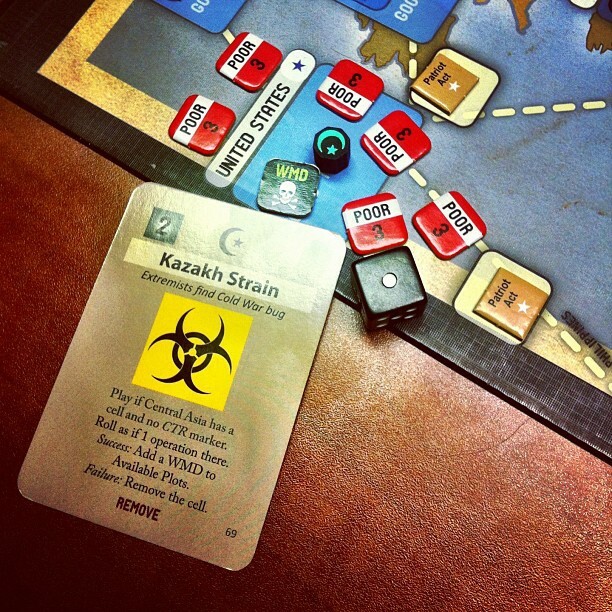 After a failed Jihadist attempt to take over Kazakhstan, US troops were sent there to stabilize the situation. Car bombs in the Gulf began to erode the local regimes, while Jihadist funding grew and US prestige fell. Throughout the game, a single jihadist sleeper cell had been waiting in Canada. It didn’t seem much of a threat. US counterterrorism officials were focussed elsewhere. Indeed, with no Islamist regimes anywhere in the world, the US was still well on the way to an end-of-game win. It was then that a dangerous strain of ex-Soviet biological weapons material was obtained by AQ operatives in Central Asia. Several jihadist cells travelled to the US, but were detected and arrested by Homeland Security. The Canadian sleeper cell, however, slipped across the Windsor Bridge undetected. The US side was out of cards, but the jihadists would need to successfully place the plot before the next turn started. They would need to roll a “1” to unleash a biological plague on the hated crusader enemy. h/t Sean Anderson for the picture, June McCabe for the mass destruction. Ha! I love this game. What a conclusion!